Just a pity the Government hadn't seen the new SLAN Report on Irish people's health before introducing yet more draconian laws in relation to alcohol consumption. Because it seems the problem they set out to cure - binge drinking - is already curing itself. Something fairly evident to anyone looking at the consumption data or even passing by empty pubs during the week. The percentage of respondents reporting that they had 6 or more standard drinks at least once per week has fallen, from 45% in 2002 to 28% in 2007. This pattern was reﬂected across gender, age and social class... 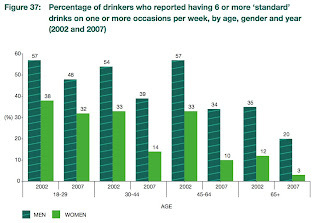 The percentage of women reporting that they had 6 or more standard drinks at least once per week has halved, from 34% in 2002 to 17% in 2007 (compared to 54% men in 2002 and 38% men in 2007). The older age groups show the largest decrease in drinking – age 18-29: 48% (2002) to 40% (2007); 30-44: 42% (2002) to 27% (2007); 45-64: 47% (2002) to 23% (2007); 65+: 27% (2002) to 12% (2007). There was also a decrease in each of the social class groups – SC 1-2: 41% (2002) to 24% (2007); SC 3-4: 44% (2002) to 29% (2007); SC 5-6: 52% (2002) to 34% (2007); unclassiﬁed: 45% (2002) to 28% (2007). Findings must be viewed with caution since the survey method has changed over this period of time (from postal self-report questionnaires in 2002 to face-to-face interviews in 2007) and willingness to report drinking excessively may differ by survey method. Fair enough: of course any researcher is going to be careful about trend comparisons when the methodology changes. But the implication of their caveat is that people are being 'economical with the truth' about their alcohol consumption when interviewed face-to-face (as in the 2007 survey). But here's the thing: the percentage that didn't drink alcohol at all in 2007 (19%) is practically unchanged since 1998 (18%), as shown in Table 13 on page 84 (104 of the pdf). I don't believe people are being economical about their lack of alcohol consumption: whatever the interview methodology. So it seems to me that there has been an overall reduction in heavy alcohol consumption (in effect, binge drinking) since 2002 as shown in the SLAN chart. Completely in line with declining alcohol sales in pubs as reported by the CSO. The report also shows a marked decline in the proportions who drink and drive: showing that consumers are getting the message about taking more responsibility for their behaviour in relation to alcohol. As I've said before, and will say again, we have a young'ish population by comparison to other EU countries, but our indigenous youth population is now in decline - and with it so are alcohol sales. The binge drinking horse has bolted, so shutting the stable door by punishing the overwhelming majority of us who don't binge drink is disproportionate and an infringement of our freedom. Simple as that.